Q: HOW DO I MEASURE THE HEIGHT OF MY HEADBOARD? A: You need to measure from the top of your mattress up, so the bottom of your headboard will start from the top of your mattress. If you wish to have a pillow stop the pillow stop will be behind the mattress. The headboard height should still be taken from the top of the mattress as the pillow stop will start beneath it. Q: WILL I BE ABLE TO MOUNT MY HEADBOARD TO THE WALL? A: Yes, you will simply need to tick the “wall mounted” option when purchasing your headboard. You will also be provided with wall plugs and screws to attach to a brick wall. Q: CAN I WALL MOUNT MY HEADBOARD ON A STUD / PLASTERBOARD WALL? A: Yes, you will need to purchase Plasterboard Fixings. If you are purchasing a very large headboard and are worried about the weight, we are able to reduce the weight for you. We must be informed before you place your order. This will not reduce the quality of the end product. 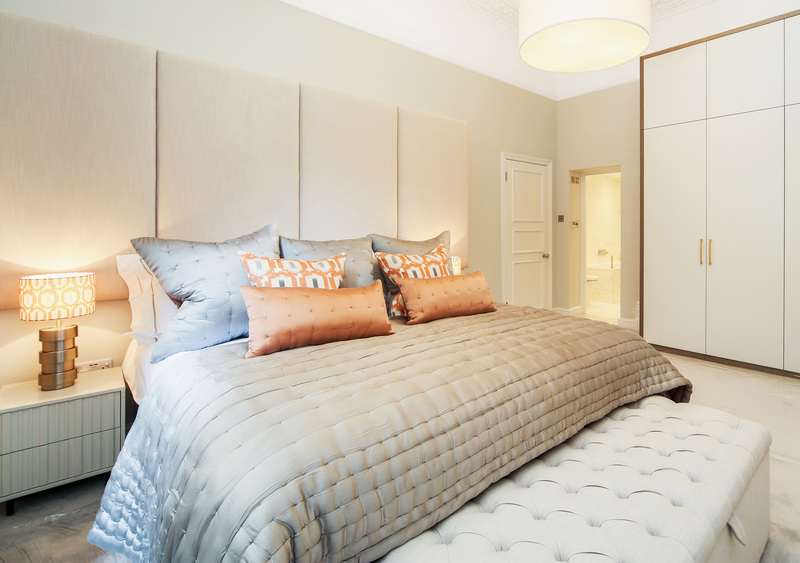 A: Our Wall Mounted headboards lie flush against the wall. This means that the headboard will be much more secure than the traditional way of using headboard struts. The wall mounting option also allows you to go for an increased height that is sure to make the headboard the focal point of your room. Q: HOW IS THE HEADBOARD DELIVERED? A: We use national couriers for our headboards and beds. Deliveries usually take place in the business hours of 8am to 6pm Monday to Friday. We are able to arrange Saturday deliveries but this will incur an additional charge. The Headboard or Bed will be delivered in customised packaging. Q: WILL MY HEADBOARD BE SUPPLIED WITH HEADBOARD STRUTS? You will need to select whether you wish to have to headboard with struts or wall mounted. Some of our larger headboards are not available on struts as we feel wall mounting will be more stable and safer for the customer. Please note: With many of our headboard designs if you have gone for the wall mounted option, you may not be able to change these to Headboard Struts in the Future. Q: WILL MY HEADBOARD COME WITH THE BOLTS THAT YOU ATTACH TO THE BACK ON THE BED? These should be supplied with the bed. We do sell replacement headboard bolts that are compatible with 95% of UK beds. Q: WILL THE HEADBOARD STRUTS LINE UP WITH THE BOLTS ALLOCATED AT THE REAR OF MY BED? If you have purchased your bed from aboard or you have a non-standard bed size, please check before placing your order. Q: DO YOU SEND OUT FABRIC SAMPLES? Yes, we offer a FREE swatch service and will post out your chosen fabric samples by Royal Mail. We send out samples on a daily basis so you should receive your samples the following day. Q: CAN I BUY MATCHING FABRIC BY THE METRE? Yes, we sell all our upholstery fabrics by the metre. The width of the roll is usually 137cm wide; but can be more depending on the fabric range. Ideally you should order your headboard/ bed valance or bed together, so we can ensure they are made out of the same roll/ batch. Q: CAN I USE MY OWN FABRIC? Please contact us with your chosen headboard design and bed size and we can advise how much fabric will be required for your headboard. Our standard lead time is approximately 14 days working from when the order is placed; this may vary depending on the time of the year. Q: HOW THICK ARE THE HEADBOARDS? We also used thinner sheet material on the larger headboards and build it out with timber to increase the strength; to keep the weight down. We currently do not offer a instillation service as we are based in London and deliver nationwide. We may be able to help with London installations if the install is to be taken place within a 10 mile radius. Yes, you work with many Interior Designers, Hoteliers and Boutique Furniture Shops. Q: ARE ALL HEADBOARDS MANUFACTURED IN THE UK? 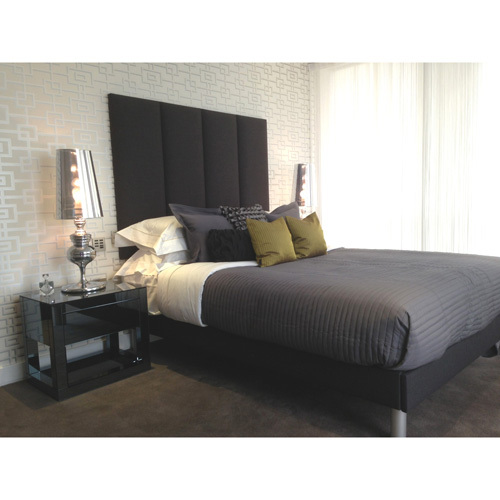 All our headboards are manufactured onsite by our skilled upholsterers and woodworkers. Our headboards can be customised to your exact requirements and we are also able to offer a fast turnaround. Q: DO YOUR HEADBOARDS MEET HOTEL / PUBLIC PLACE FIRE REGULATIONS? Q: ARE ALL FABRICS SUITABLE FOR MATCHING COLOUR BED VALANCES AND CUSHIONS? A:We can make our bed valances and cushions from all of our upholstery fabrics excluding Premium Faux Leather.